Although Reptiles and Amphibians belong to two different taxonomic classes, they are often lumped together. Both groups share some ecological similarities and may even look superficially similar. Some are familiar garden inhabitants, others less so. Several of our amphibian species thrive in the garden and five of the native species (Common Frog, Common Toad and the three newts) can reasonably be expected to be found in the garden for at least part of the year. There are also a few introduced species which have been recorded from gardens, notably Midwife Toad, together with our other native species. 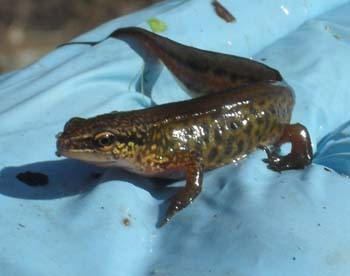 Amphibians spend a great deal of time on land, which surprises many people, so it is quite possible to find amphibians in gardens without ponds. Although less common in gardens than amphibians, one of our reptiles, the Slow-worm, is resident in some areas. The Grass Snake, our largest and most mobile reptile, is a garden visitor, seeking amphibian prey in ponds or sometimes using compost heaps as egg-laying sites. The Adder is less likely to visit gardens and the Smooth Snake is rarely found outside it heathland habitat in southern England.